Lily bulbs can be planted in pots, for flowers this summer. After growing on indoors or in a cool greenhouse, they can be moved onto the patio when in flower, so that you can enjoy the blooms. Dahlia tubers stored over winter (or bought this year) can be started into growth. Place them in a light, warm place to sprout before planting. They will need additional misting with a spray-bottle of water, to stop them drying out. Bulbs coming up in the rock garden or in containers may benefit from overhead protection from the rain and snow. A sheet of glass or Perspex placed on piles of bricks will do the job. Hardy annuals can be sown in pots or modules to provide colour. Place gladioli corms in seed trays or boxes and place in a light, warm spot around 10ºC (50ºF) to encourage them to sprout before planting. This will ensure an earlier display. Sweet peas can be sown under cloches, in a cold frame, or in a cool room in the house. Any sweet peas that were sown earlier in the autumn can now be potted. Root cuttings can be taken of Papaver (perennial poppies), Verbascum (mullein), Acanthus (bear’s britches) and Phlox. Check on tender plants overwintering outdoors to ensure protective coverings are still in place. Cut back deciduous ornamental grasses such as Miscanthus and other perennials left for winter interest. Continue to deadhead winter pansies and other winter bedding. Pansies will carry on into the spring and even to early summer, if attended to frequently. At the end of the month prune back the stems of pot-grown fuchsias, which are overwintering under cover, and place in a well-lit, warm place to encourage new growth. Divide and/or plant bulbs-in-the-green such as snowdrops (Galanthus) and winter aconites (Eranthis hyemalis). Divide clumps of herbaceous perennials that you want to propagate, those that have become too large for their allotted space, and those that are flowering poorly or have lost their shape. Test your soil for pH and nutrient levels; this can help you choose suitable plants for your garden, and allow you to rectify any nutrient deficiencies with a spring feed. Simple tests can be done at home (see left), and the RHS also offers a soil analysis service. Improve the drainage of heavy soils by working in lots of organic matter and coarse gravel (if necessary). Clear up weedy beds before mulching. Mulching with a deep layer of organic matter helps to condition the soil, suppress weed growth, insulate plant roots from temperature fluctuations, and conserve soil moisture during the summer. Lighter soils can be mulched now, but heavier soils are best left until March, when the soil is warmer. 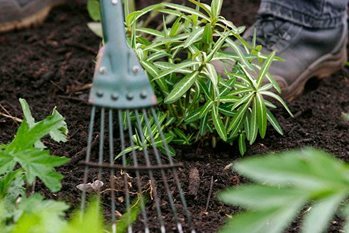 Towards the end of the month, you can top dress beds and borders with a balanced fertiliser such as Growmore or blood, fish and bone, to feed perennials as they start back into growth. Check whether containers need watering. Pots that are sheltered by eaves or balconies can miss out on any rainfall. Check the compost at a hand’s depth to see if it feels dry. Aim to keep pots moist, not wet. Pots and containers benefit from topping up with fresh John Innes compost. Old compost can be removed and replaced if there is not much room. Remove dead leaves from around the basal rosettes of alpine plants such as saxifrages to prevent rotting. Top dress spring-flowering alpines with grit or gravel to show off the plants and to help prevent stem rots. Snowdrops can be vulnerable to botrytis (grey mould). On winter pansies watch out for downy mildew and black spot. Remove any infected leaves and destroy badly affected plants. To avoid the build-up of diseases, do not to plant pansies in the same place every year. Look out for rots (such as crown rot, sclerotinia, delphinium black blotch, phytophthora root rot and antirrhinum rust) on emerging perennials and shrubs. Hellebore leaf spot can be a problem on old foliage of hellebores. Cutting back the old leaves should control the problem, and allow the flowers and new growth to be better seen. Protect sweet pea plants from aphids as they can transmit sweet pea viruses. Check autumn-sown sweet peas growing in cold frames, and apply mouse and slug controls if necessary. Inspect stored tubers of plants such as dahlia and canna for signs of drying out. Do not let them become bone dry or they will desiccate; but too wet and they may rot. Order catalogues for spring planting of summer-flowering bulbs, bedding plants and herbaceous perennials. Stock up on stakes and ties for the coming season, if you have not done so already. Plan your summer bedding and container planting schemes in good time for ordering the necessary bulbs, annuals and seed, and for propagating the relevant material.